Clothed Minds: "And so I says to her, I says, Margaret, no man is going to ask you on a date when you have those cankles, and SHE says...."
Hello! I've been following this blog for some time, and I wanted to let you know that I have given you a blog award. You all are hilarious! 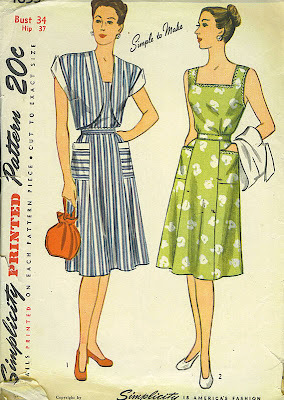 Simply delightful summer pattern. I'm always a fan of generous sized pockets on casual frocks - plus the slightly pointy-sleeved bolero is just darling, so I'd definitely give this pattern a whirl. Many thanks for your recent blog comment over at Chronically Vintage, I sincerely appreciate it and hope you have a fantastic countdown to Christmas. (I can say that because I am old) what is a 'cankle'? So I says to Mabel I says what a great blog. These are very interesting and captivating retro photos. This is a really good quote and it would seem that it would be quite difficult to find a date if you have cankles. That is why they invented weight loss programs. Thank you for sharing. I look forward to your wonderful posts. They're favorite and useful things for me.